1. Mix together 5 litres ofwater, 3/4 cup sea salt, 1/4 cup sugar, a star anise and a tablespoon of clovesand bring to the boil. When the mix has cooled, immerse the 3kg joint and leavein the fridge to brine, covered, for 24 hrs. Brining in spiced water drawsout the excess water, while keeping moisture in. 2. After 24 hrs, wash offthe brine. Place the ham in a large pan, cover with water and bring to theboil. Lower the heat to a gentle simmer and cook, uncovered, for 2.25 hrs,topping up with water as necessary. Turn off the heat and leave the ham to coolin the water. 3. Heat oven to 220C/fan200C/gas 7. Remove the ham from the water and cut away the top layer of fat andskin. Mix brown sugar, honey and mustard together. Score the fat in acriss-cross and brush half of the sugar, mustard and honey glaze overthe ham, then stud each 'diamond' with a clove. Mix the remainingglaze with the orange juice. Roast for 30 minutes, basting it every 10minutes with the remaining glaze. Allow the ham to rest for at least 10 minsbefore carving, serve hot or cold. 4. If hot, serve withseasonal greens (we had first crop of the season asparagus) and potato gratin. If served cold, serve with potato salad and waldorf salad with bread. The first of our wonderful forced rhubarb has arrived straight from the ‘rhubarb triangle’ and this recipe pairs it with crispy pork belly from Bridget B's farm. Serve with steamed purple sprouting broccoli and salad potatoes. 1. For the rhubarb chutney: heat the olive oil in a heavy-based pan and sweat the onion and ginger for 3-4 minutes, or until softened but not coloured. 2. Add the remaining chutney ingredients to the pan and stew gently for about one hour, or until the mixture is thickened and has the consistency of jam. Season, to taste, with salt and freshly ground black pepper, then set aside to cool. 3. Preheat the oven to 220C/gas mark 7. 4. For the pork: season the pork belly with salt and freshly ground black pepper and place onto a rack set over a roasting tray filled with water (the water will stop the oven from filling with smoke from the dripping fat). Roast in the oven for 30 minutes, or until the skin is beginning to brown and crisp up. 5. Turn the oven down to 160C/gas mark 3 and roast the pork for 15 minutes. 6. Squeeze the lemon juice over the skin and continue to roast for a further 20 minutes (the lemon acid will help to crisp up the skin), or until the pork is cooked through and the skin is golden-brown and crisp. Remove the pork from the oven and allow to rest for 30 minutes. Make your own meatballs with our lovely venison mince from Gill Wing Farm. 1. For the meatballs, beat the eggs and milk together in a bowl. Add the minced venison,breadcrumbs, parmesan and garlic and mix well. 2. Mould the meatball mixture into balls, each the size of a golf ball. 3. Place the meatballs onto a plate or tray and chill in the fridge for 20 minutes. 4. Heat the oil in a frying pan over a medium heat. 5. Remove the meatballs from the fridge and place into a hot frying pan. Fry for 8-10minutes, or until golden-brown all over. 6. For the ragu, heat the oil in a separate frying pan. Fry the onion, carrot, celery and garlic for 5-6 minutes, or until softened. 7. Add the tomato purée and cook for a further 7-8 minutes, until the sauce is thick and deep red in colour. 8. Add the wine, chicken stock and rosemary and bring to boil. Reduce the heat and simmer for 45 minutes to an hour. 9. Add themeatballs to the sauce and simmer for 5-6 minutes, until the meatballs are completely cooked through. 10. To serve,place a generous portion of cooked spaghetti into each serving bowl. Spoon over equal amounts of the meatballs and sauce, and finish with grated parmesan. Arnolds Farms Ltd, Bennets Farm, Ombersley, Worcs. This is done in a slow cooker but if you don’t have one, you could transfer the casserole dish in the oven at 160 centigrade, 140 fan for about 4 hours or so. The slow cooker is a lifesaver for me especially during the week – ten minutes prep before bed and dinner is pretty much done when I get home. We ate this with rice and green veg, but it’s equally good as a pie filling with a nice crisp crust to it. Heat the oil in a large frying pan and brown the meat all over. With a slotted spoon, transfer it to the slow cooker, leaving the juices in the pan. Fry the onion, carrots and garlic cloves in the juices until the onions have softened. Add half the brown ale to the pan, stir well and then pour this over the meat. This step also really helps with the washing-up! Pour the rest of the ale into the slow cooker and add the thyme and runny honey. Season with a good pinch of salt and some freshly ground black pepper, then stir and forget about it on a low setting. When you’re just about ready for dinner and have got your mash, rice or vegetables ready, melt the butter in the microwave or a pan. Stir in the flour and add this mixture to the casserole, stirring briskly to avoid lumps. Add the balsamic vinegar just before serving. If you want to make this into a pie you’ll need 500g of shortcrust pastry, and I would let the filling go cold before you assemble your pie. Cook it on a preheated oven sheet to help avoid a soggy bottom, oven temp 200 centigrade, 180 fan. From Yew Tree Farm, Knutsford, Cheshire. My husband hates cabbage – in pretty much all its forms. Even he ate this quite happily! Don’t add extra salt as the gammon provides plenty. I like to serve this with crispy baked potatoes. 1) Heat the oil in a casserole dish. Fry the gammon steaks until lightly browned on both sides, and season with black pepper. 2) Add all the veg and stir around, then add the cumin and dot with butter. 3) Add in the potatoes, and pour over the lager. Put the lid on the casserole, turn the heat to low and cook for around 3 hours until the gammon is super-tender and the veg lovely and soft. A stir from time to time won’t do it any harm! By the way, this will not mind at all hanging around for far longer, the meat will just get more melting and the vegetables’ flavours meld more perfectly. 4) Just before serving, take off the lid and let the liquid bubble and reduce a bit. Such a favourite is this in our house that I have to make a few extra just so that they can be reheated for the children the next day. A very simple and tasty way to cook the new season’s first crop tomatoes. This recipe serves 4 greedy people! 1) Preheat your oven to 200 centigrade, 180 fan. In a bowl, combine everything but the tomatoes using your hands – it will be sticky but not to worry! 2) Cutting around in a circular motion, take the tops off the tomatoes and scoop out all the seeds and core with a sturdy teaspoon. Don’t chuck the bits away – you can use them in a sauce or even sieve them and drink it! 3) Get out a gratin dish big enough to hold the tomatoes snugly and drizzle the olive oil over the bottom. 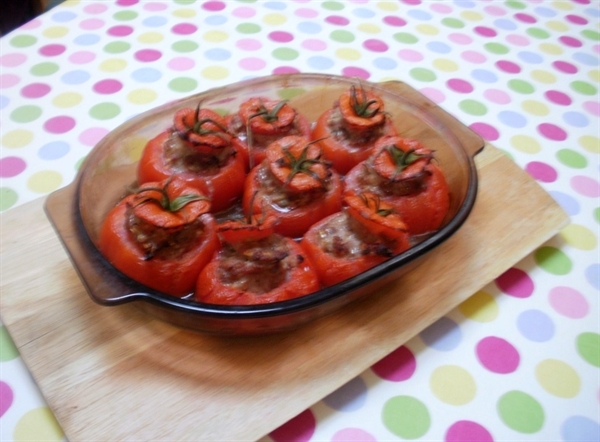 4) Fill the tomato cavities with sausagemeat filling and replace the tops. Place in the dish and bake, uncovered, for about 45 minutes until the tops are just beginning to char a little. We eat these with plain basmati rice and perhaps some steamed broccoli or stir-fried asparagus. Enjoy! Try something different with roast chicken - use the leg meat to fill a stack of pancakes to serve alongside. 1. Preheat the oven to 160C/325F/Gas 3. 3. Melt the butter in a frying pan, add the spring onions and cook gently without browning. Add the tomatoes and season with salt and pepper. 4. Add the parsley, cook for two minutes then set aside to cool. 5. From the neck end of the chicken crown, release the skin to form a pocket without piercing it. Put a quarter of the tomato mixture under the skin and then reshape it. 6. Heat a clean pan, brush the chicken legs with oil, then brown them all over. 7. Rub a tablespoon of oil over the chicken crown. Put the crown and the legs on a roasting tray and roast for 35-45 minutes, until the skin is golden-brown and the juices run clear with no sign of pink when the meat is pierced through the thickest part with a skewer. Set aside to cool. 8. Meanwhile make the pancakes. Mix the flour, egg, milk, butter and herbs together to make a batter. Heat a little oil in a frying pan and cook the pancakes. Using a 6cm/2½in metal chef's ring, cut mini pancakes from the large ones. 9. Remove the skin and bone from the chicken legs and shred the leg meat. 10. Heat half the remaining tomato mix with the shredded chicken. 11. Grease the metal rings with oil then layer up the pancakes and the chicken tomato mix, starting with a pancake, in the rings. There should be four layers of pancake and three of chicken. 12. Reheat the pancake stack in the oven until hot through, and heat the remaining tomato mix for the sauce. 13. Take the crown meat off the bone and divide it between four plates. Serve with a hot pancake stack and the remaining sauce alongside. From Eric Wall Nursery, Barnham, W. Sussex. Rinse the beef under cold water then place the beef in the largest saucepan you have. Cover with cold water, add the beetroot and bring to the boil. As soon as the water is boiling reduce the heat to the lightest simmer. The water should be still, with tiny bubbles on the surface. After 20 minutes use a strainer to remove any froth from the surface of the water then add the rest of the ingredients to the pan. Continue to simmer gently for 2 ½ to 3 hours. Test the beef by sliding a fork into the middle of the joint. If there is little resistance, the beef is perfectly tender and ready to serve. At this point turn off the heat and, if ready to serve, place the beef on a serving board and allow to rest for ten minutes. Be sure to carve across the grain for the tender, melt-in-the-mouth slices. Traditional accompaniments to salt beef include dill pickles (gherkins), cornichons, sauerkraut, English mustard, boiled or mashed potatoes, cabbage and carrots. If served as a sandwich white rye and carroway bread (with no butter) or in a bagel. A great seasonal recipe, conjured up by a restaurant called 745pm, which is close to Sutton Hoo Chicken Farm. - 500gms Desiree potatoes peeled and cut up small. Peel and chop the shallots and place them with the butter in a little saucepan. Just melt the butter to coat the shallots and set aside. Chop the rosemary leaves, just cover in olive oil in another small saucepan and heat until the water in the leaves starts to boil off. Turn off the heat and leave for at least an hour to allow the rosemary oil in the leaves to infuse into the olive oil. Place the thighs in a preheated oven (250oc). Cook for 20 minutes by which time the skins should be nicely browned and crispy. Whilst the meat is in the oven boil the potatoes, and when cooked, mash them. Warm up the shallots and the rosemary. Add the mashed potato to the hot shallot mixture. Strain the hot oil from the rosemary leaves into the mix and fold everything gently together. You are now ready to assemble the dish. Place a neat pile of the rosemary and shallot mash in the middle of the plate. 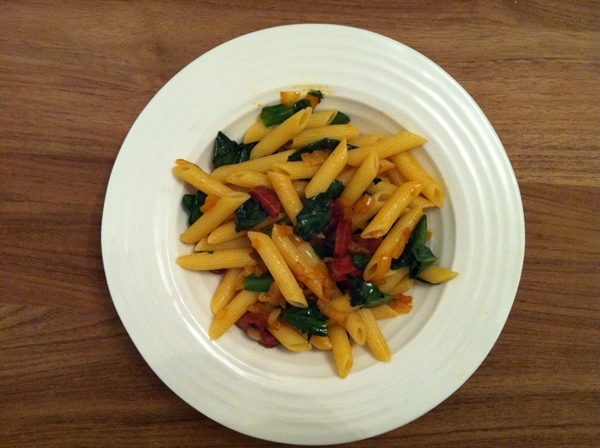 Put some chard & garlic leaves on top and carefully place a thigh on top of that. You may wish to serve another vegetable with this - eg some roasted cherry tomatoes. An quick, easy and tasty way to enjoy a whole chicken. Adding the lovely blend of radicchio, kale and mustard leaves, gives the roasted lemony chicken both colour and pepperiness! Season the chicken portions with olive oil, dried mixed herbs & two crushed garlic closes and put into a roasting tin. Cut the lemon in half, squeeze the juice over the chicken, and put the empty shells into the roasting dish. Roast for 40 minutes, and then remove from the oven. then tear up the mixed spring salad leaves and tuck them in under the chicken portions, so they are sitting in the sauce. Return to the oven for a further 6-8 minutes. Remove from the oven, and service with either steamed rice or cous cous.